At Sensors Expo 2017, Jim Brownell, one of All Sensors’ sales managers, explained the progression of microelectromechanical system (MEMS) pressure sensing over the past 30+ years from All Sensors’ perspective. Check out that interview here, courtesy of EE World Online’s Sensor Tips. Power Washing or Pressure Washing? Washing your car or hosing off the driveway typically uses about 40 to 50 PSI of pressure. In contrast, the pressure in a power washer or a pressure washer can be 40 to 200 times higher. While these terms are sometimes used interchangeably, a power washer uses a high pressurized stream of hot water and pressure washer almost always uses high pressure cold or normal water. The operating pressure of the pressure washer varies considerably depending on the level of the machine. Commercial grade pressure washers, can be from 1000 to 4000 PSI with pressures below 2000 PSI more common in more affordable units. For example, one electric pressure washer operates at 1600 PSI (max) and delivers 1.2 GPM (max). Another example, operates at maximum volume of 1.6 GPM and a maximum pressure of 2000 PSI. Semi-pro pressure washers have a significantly higher power output, PSI and GPM ratings than commercial washers with 1800 to 3000 PSI and 1.6 to 4 GPM being typical ranges. These units typically use only cold water. Unlike an electric unit that operates at 1800 to 2000 PSI max, a gas type unit can deliver 2500 to 4000 PSI. At the high end, professional pressure washers are rated at 3000 to 8000 PSI and 2 to 8 GPM and deliver cold and hot water. Pressure regulation is common in these units that allows decreasing the pressure for mixing with detergent, increasing the pressure for removing mold from brick or decreasing the pressure to sanitize commercial kitchens with hot water. Common applications of profession pressure washers include car washes, kitchens, meat packing facilities and more. All Sensors CPA 602 Series media isolated ceramic amplified pressure sensors can address pressure measurements in pressure and power washing systems up to 6000 PSI. 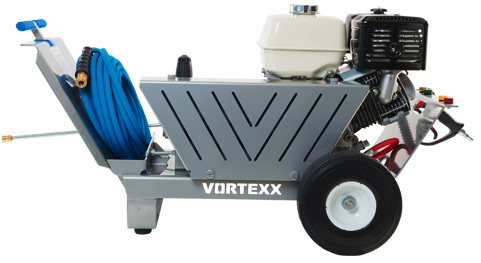 This professional pressure washer operates at 4000 PSI and 4 GPM max. Posted on September 12, 2017 Author CynthiaTags All Sensors, CPA 602 Series, power washer, pressure, pressure washerLeave a comment on Power Washing or Pressure Washing?